manish blogs | Life is all about experiences….!! Life is all about experiences….!! 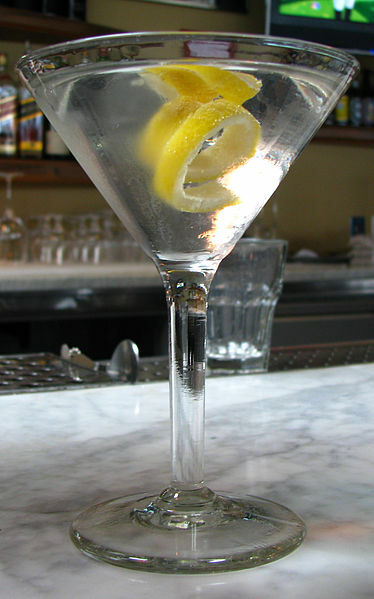 Week Four, Part-I….Vesper and Martini vibes…!! The destination was unknown, so the ‘info-services’ and ‘navigation systems’ were the sources relied upon. Search was on for a place to sit down and relax rather than hop around in the city. But, as it always happens in a group, there was a difference in opinion on this as well. Soon, people separated according to their preferences and I was lucky to get a good majority supporting me. After a lot of travelling and navigation hiccups we finally found a place to hide ourselves from normal folks. Well, the “Confidentiality Norms” don’t allow me to explain much about the place but I was surely getting the ‘Casino Royale’ memories as I sat on to the cozy ‘lazy bag’, I could certainly feel the “Vesper and Martini vibes” in the atmosphere around me. “Chilled..! !” was our order and it was very well obeyed. It’s not that I am not used to this kind of an atmosphere or it was something “alien” to me but it was all happening after a very long time. The pungent aroma of the “brew” and the strong bitter taste of the fresh “hopps” took me back to my days at the brewery. Though I may be sounding like a ‘drunkard lunatic’ here but I have the will and the courage to admit that I was really having a good time with my buddies,who were also having somewhat the same kind of experience. “Martini” or its modified version “Vesper” was what I was looking for. “Gosh, that’s certainly a drink” but I guess I was being too ambitious as this was no “Ian Fleming” classic to fictionally produce anything out of the thin air. So, as the title suggests “vibes” was the only option. Pizza was the unilateral choice considering the proximity of the “kitchen”. But damn! Waiting there as well. The only thing that bothers me about these “famous eateries” is the waiting time, feels like a fool standing in the line just to have a bite. But, considering the gravity of the situation I kept my “Jat-bhaav” (“strong emotions of a person from Jat caste”) in control and kept sipping ice-cold water to calm my nerves. Finally, we got a table or to say a round table with a “u-shaped” sofa enough to accommodate seven of us. “Mach 5” was really making a difference, all the “guilty ones” were unable to get a sense of the pitch of their voice. In simple words, we were shouting. The best part, none of us had any clue of our misbehaviour. “Please Sir, other guests are getting disturbed! Can you talk a little slower?” The waiter requested us. “What an idiot?” I said to myself. No, not because of his gesture, he was perfect with his concerns but the sentence concentration lacked the much required clarity of words. Of course, using “slower” for pitch of voice is absolutely wrong, it required an antonym of “loud” i.e. “soft” or even “gentle.” But he was a waiter and I believe I was again expecting a great deal out of him. Now, I am not trying to boast myself here but these were the actual thoughts that crossed my mind at that particular moment. “We’re sorry!” I gently apologized. “Nawaab” was staring at me with his mouth wide open. Yes, the expression of amazement was an answer to my humble behaviour which was not going with the image that we ought to carry. But you can’t keep a sausage in a dog’s house for long, we were again “normal”, shouting the hell out of the other customers. The dinner was awesome, “Thoda khao, thoda fenko”(“Eat some, throw some”) was our mantra. Indeed, this did not help much to improve our reputation in the restaurant which was already badly tarnished. Well, after having a nice and strong, lemon-flavoured ice tea I was in a mood to lie down there itself but my “management” didn’t provide me that luxury. As a result, we made our way back to the campus. On way, in the auto-rickshaw I was getting cute slaps of cool air on my face. Nah, not everything is related to the aftermath of sipping “the holy water,” although I am not very much convinced with these so-called “preconceived notions.” Anyhow we reached our temporary home without much dramatics involved. I am generally a little quick with my steps but tonight I was not getting my perfect speed. As per my estimates, I had to move a little faster but God only knows why I was way ahead of the folks accompanying me. “Jab jhel nahi sakte to kyu karte hain ye sab?”(“Why do they do all this if they aren’t capable to bear the consequences?”) I asked to myself presuming their faults and my wise thinking for the same. Well, after trying too hard I matched up to them, forever generous as I am. Back on the third floor corridor I could still feel the “aroma” observed earlier. Speed was alright now. We went to our rooms, changed and were ready to create some well-needed havoc. “Nawaab” and myself were giggling with joy.“Hahaha! Pass na hone ke bhi apne faayde hain”(“Not clearing the exams also has its benefits.”) We shared these similar thoughts and were looking at the positive side of life that is so difficult for many. To be positive and happy is no rocket-science and I believe we ourselves avoid these “positive vibes” just to pretend in front of the world that we are helpless or as we say in Hindi,“Bechaara haalaat ka maara”(“Helpless poor being”). By the way, I suddenly experienced those “Vesper and Martini vibes” again, no wonder Star Movies was showing ‘Casino Royale’ that day. Sunday it was, and what a disaster of a morning. I was up early if you compare with our regular standards but it was horrible with no water to drink and anything to eat. Fortunately, one of the rooms was open and I found some water in one of the jugs. I went back to sleep again and was awakened with a ring on the intercom. My table-tennis champion friend was on the other end, he requested me to come for breakfast to which I immediately agreed. “Nawaab” and my roommate had already left for some place with others and I along with my table-tennis champion friend, “Dabangg”, high-power spectacles friend and a girl from Indore decided to visit a nearby shopping mall. The girl from Indore was almost a complete stranger to me till now and I feel a bit awkward to move with a stranger, but she came along as a very nice person and we were soon talking which comforted me a lot in the group. We reached the mall, straightaway went to the food-court and ordered a lot of burgers, fries and cold drinks. After eating well or I should say too well, none of the guys were in a position to move from their seats. But, we were forced to move around in the shops by the kind ladies which we of course couldn’t deny. Typical man psyche, falls for anything that the opposite gender demands. Yes indeed this is a very grave problem but the solution is still unavailable and it’s not helping the “human cause” much. We wandered around in the mall. I was recommended to buy a certain brand of perfume and I was busy searching that. Meanwhile, my table-tennis champion friend bought a pair of converse and the girls were, as always, taking their own time. Well, we decided to split as me and my table-tennis champion friend were looking for some apparel now. “What a deal?” was our reaction, two t-shirts for Rs.350 only. The best part, we realized that there was a double-discount scheme only after we paid the bill. My t-shirt says “Hey Ho, Lets Go” and it still reminds me of our days at COE. We couldn’t find the perfume but the “super-bargain” t-shirts made our day. It was already evening and we decided to head back to our “own world.” On getting back we straightaway went to the canteen and had tea. Even our very own Canteen Man,“Anna” as we used to call him, couldn’t believe the amazing offer that we had availed on the brand new t-shirts. Owing to my generous nature, I offered him the same at double the price without mentioning about the offer, but he somehow found out the bill and my business deal was cancelled. Back into my room, I had my roommate waiting with a display of clothes that he had purchased today. “Some solid shopping, huh..” I asked him. He smiled and started showing his purchases one by one to me. “Boka,” as we used to call him, was a very religious person but very lively and stylish. He always preferred bright colours which was evident in this purchase as well. In my opinion, both “Nawaab” and “Boka” would stand a very close competition in terms of “tapori dressing.”Not to forget that I tried hard to dress like them but always failed. ‘Fabulous evening’ is the only expression that I can think of. Nobody was concerned as to what was going to happen the next moment. I am not sure whether this type of atmosphere would ever appear again around any of us and that makes me even more determined to create a situation where we all can come and meet again with the same zeal and excitement. Our dinner started with a quarrel with one of the guards. He switched off the mess-lights while we were still eating. This was not tolerable at all, and after the “formal meeting” it was a “ringing knell” for the guilty one. “Nawaab” and myself were exasperated and were just going to lose our cool, suddenly “Dabangg” appeared and handled the situation. Anyways, we were able to eat now and I swear to God the rice tasted awesome that night. I enjoyed my meal without any “unnecessary vibes” bothering me and with the weekdays starting from next morning the much talked about “Vesper and Martini vibes” were a strict no-no for a good time now. to be continued to Week Four, Part-II………..
Week Three Part-II….Waking up from the dream..!! Every voice in the corridor of the third floor of the Residential Block was talking about Sreeram JVC, “Arre, kal wo Sreeram aayega na, bahut suna hai uske baare me..! !”(Hey, Sreeram would be coming tomorrow, have heard a lot about him..! !”) was a common expression. But soon all this ‘Sreeram saga’ was over as we had a much bigger and better reason to celebrate. Yes, it was the same twenty-four hour day which had a ‘cruel beginning’ for me and now it was going to end with lot of pomp and show – a grand birthday celebration, after all it was ‘bhai ka birthday…!! '(‘bro’s birthday..!!’). The reason for choosing the word “grand” is also a significant disclosure that should be made sooner rather than later. The birthday boy had turned twenty-one today and also secured ‘Rank 21’ in CA Final earlier this morning. So a double ‘twenty one’ was worth ‘a grand celebration’. “Party organize karne me to apna jawaab nahi…”(“Nobody organizes a Party better than us..”) was the ‘Bajrang Dal’ reaction to the occasion. It’s not easy to manage the multiple ideas pouring in from various corners, but people from Haryana have this amazing ability to absorb the pressure and still deliver the goods efficiently. Well, we were lucky to have one such guy in our team. He belongs to the ‘Land of Mahabharata (a sacred book for Hindus)’, Kurukshetra. Though not a very honest and simple person he is certainly “not a terrorist” which will be better understood in the weeks to follow. He was very fond of dressing perfect to match the occasion, I seldom found his shirt wrinkled or the crease of his dress going awry. He was our ‘Ordering and Logistics’ manager from that day. We decided to order pizzas along with the choco-lava cake and some garlic bread-sticks, not to forget the cold drinks and cheesy-dips. I don’t exactly remember the number of pizzas ordered but it was somewhere around twenty medium-sized breads, can’t guess the number of cold drinks and the other side orders. Our manager worked really well as the birthday boy needed everything to be perfect. ‘The Party thrower’ is a class apart, a perfectionist but not a snob, somewhat aggressive and my God I can never forget the all steel ‘Longines’ watch that he used to sport with eternal pride. Being a ‘Punjabi munda’ (‘boy from Punjab’) he was an extrovert with an opinion on almost everything. But the rare innocence in his attitude is worthy of appreciation. You don’t need to be a bookworm to excel in academics is something which can be easily described just by referring to him. So, the party was a thoroughly enjoyed event. We ate more than our own expectations and I along with other ‘party animals’ discovered our love for the ‘Dominos Cheese burst base’ though the choco-lava cake is still a no-no for me, an opinion objected by many. Also, a party is not over until some ‘hooliganism‘ is created by the participants and we were not in a mood to leave things incomplete. Our Residential Block was divided into five floors. First floor was allotted to the ‘pretty ladies’ of the batch, second and third floor were allotted to ‘not so gentle men’ of the batch, fourth and fifth floors were kept empty, with the fourth floor being used as a place to dry our clothes. Third Floor was the ‘famous floor’ and why not, it was occupied by the ‘Bajrang Dal’ participants, though adequate support was also provided from the second level as well. Room no. 310 – the registered office of the ‘Bajrang Dal’ and 306 – the room for “formal meetings” (my room) were very well-known to the “active” people in the batch. Cold drinks was the only thing we had in plenty and I say that strongly because you don’t want to waste “precious things” just to create some “tamaasha” (“fun”). So, the stage was set to ‘break some rules’ and the place chosen was ‘The Lounge’ on the second floor. Somebody had suggested the first floor for the plan of action but that would have been ‘too ambitious’ a step for us to put forward. As a resident of the third floor I would compare the ‘relations’ among the three floors as that between Pakistan, Nepal and India for the first, second and third floors respectively. ‘Pakistan’ and ‘Nepal’ had considerably healthy relations from ‘India’s’ point of view. On the other hand, ‘Nepal’ and ‘India’ had good relations subject to certain differences and ignorance that was inevitable. Finally, relations between ‘Pakistan’ and ‘India’ resembled to the on-ground reality in the world’s Geo-political scenario. Also, the above comparison is purely based on my personal observations and I am the only one to be held responsible for it. We gathered all the cold drink pet bottles and joined the others in ‘The Lounge’ area of the second floor. I was operating Dada’s camera, ready to capture the moments of fun. Not bothered about the safety of the electronic gadget that I was carrying I moved in closer to get a better view for the camera. My only mistake, I exposed myself to a half filled bottle held by none other than the birthday boy. Before I could make any adjustments to secure the gadget and myself I could feel the ‘orange flavour’ all over. “Bechaara camera, wo bhi nahi bach paaya…”(“Poor camera, it became the victim as well…”). Soon the lounge was all covered with sugary syrup, so we moved out of the lounge into the corridor. Now, as everybody was sporting the “Cola look” it was ensured that the corridor was also adequately “decorated” in line with the lounge. It was “say cheese time” and the happiness on all the faces was everlasting. I, along with many, was “waking up from the dream”. The whole residential block was resonating with the lyrics of a latest bollywood hit “Dil sambhal jaa zaraa…” from the movie “Murder-2”. It had somewhat become as the ‘song of our batch’, thanks to our very own “Nawaab” who was an expert in setting these landmarks. Well, the much hyped “Sreeram JVC day” came and I was expecting a young and handsome guy with cuff-linked shirt and a formal suit on, but I was so wrong. Not all my presuppositions were wrong though as he was a smart man, not very much physically but certainly in intellectual terms. He wore a half-sleeved cotton shirt and formal trousers with his “beer belly” speaking a lot about himself. He sported a mustache and beard with his spectacles giving him a “philosopher look”. I really liked his walking style, he took small steps but really hurried on with them. Well, I was lucky enough to observe these characteristics as most of the other guys were peeping out of the huge glass windows of our “conference hall” just to get a sight of his car. It was a “black Mercedes E-class” shining and sparkling in the bright sunlight. The number of “Merc owners” in India may have increased over time but still it is a “rare luxury” in my opinion and that drew our attention towards it more than anything else. He began by introducing himself and soon everybody realized that he had great communication skills. Although he spoke real fast yet everything was easily comprehended by the audience. We were all looking towards him in anticipation of a “Guru-mantra” that would free us from all our worries. He was seen as a “Spiritual Guru”, a saviour for the depressed souls. The topic for the day was Leadership, team building and attitude at workplace. The first objection that Mr. Sreeram raised was with respect to our dress code, he rejected our formal attires and asked us to dress more casually. This man was really a clever manipulator and knew exactly what to convey to the young audience to make a mark in their hearts. He often cracked jokes on the “COE administration” and had a fair idea of the general mindset of the participants with regard to the same. Two sessions i.e. three hours over for the day and I was a fan now ready to sail in the boat provided by our faculty. Towards the end of the second session we were asked to participate in a “Movie game”. Teams were divided and movie clippings were allotted. The teams had to present their cases on leadership, attitude and team work examples provided in the clippings. We were asked to sit with our teams during our lunch time and discuss, though very few adhered to the instructions provided by the faculty. The world suddenly went upside down for me, I knew she was referring to “The Horror Show” and those “wretched thoughts” again went through my mind. She belongs to New Delhi, not Faridabad, and I didn’t have much of an interaction with her before today. But as I was preparing to answer her query I realized that she was the one who “decorated” my face with the “controversial cake” during “The Horror Show” celebrations. This fact made me a little comfortable as I had realized that she didn’t knew that I was one of the unsuccessful candidates. “I didn’t clear”, I replied. She acted as if she had a lot of sympathy for me and I had no option but to accept the returned favours, though I tried hard to reject it as I hate to carry the image of a unblessed helpless boy. I take pride in my own scheme of things and would prefer accepting my defeats rather than blame it on my luck and getting tagged as a “poor chap”. Nevertheless, may be I would’ve acted the same if I would’ve been in her place. Disturbed, I went for lunch. Third session i.e. the post-lunch session began and we gave our presentations. It was an enjoyable activity and everyone participated. In the end, Sreeram gave his feedback and opined on our performances. He also showed some leadership and team work videos which were really inspiring. I personally enjoyed the concept of ‘Secure slavery vs. Absolute freedom’ a lot. The way he explained the concept comparing an ‘elephant in a zoo’ and ‘elephant in a jungle’ was amazing. Well, the day ended, it was a long day full of leadership and attitude quotes and I was certainly feeling pumped though was a bit tired as well and badly needed some energy to revitalize myself. But not for long as soon the very important “formal meeting” was organized in my room attended by the regular participants. Now everybody had their eyes wide open in delight though the reason is still unknown, a perfect description of “waking up from the dream” of “the horror show”. “We don’t give a damn! !” was the common intent shared by all of us in Room No. 306. “Thud-Thud!” was the sound on the door, I reached out and unlocked it. My friend from Jodhpur who had given us nicknames was standing half-dressed in the doorway, he rushed inside and shouted, “utth jao saalo! Khushwaha ka lecture hai, lanka lag jaayegi!”(Get up idiots! Its Khushwaha’s lecture, he would give us a hard time otherwise”). In the process he kicked my roommate who was still enjoying the cozy pillows. I asked the visitor,“What’s the time?” He laughed and replied, “Nau chaalees ho gaye hain, dus baje se lecture hai.”(“It’s already nine-forty, lecture starts at ten”). My expression to this is not worthy of a description here. To hurry up we decided that I would use my Kerelite friend’s room to get ready whereas my roommate would use ours. A world of thoughts went through my mind as I was arranging for my chores. The faculty for the first two sessions was our Deputy Secretary – Mr. Satish Khushwaha. His personality has already been described by me in the first week edition. I was even more worried as I was already on his “Hit-List” and the last night saga also didn’t help our cause much. Actually, Mr. Khushwaha had stayed for the night in our Residential Block itself to attend the early morning lecture today. This was a “golden opportunity” for us and we made the most of it by shouting slogans, not slogans actually but some “disturbing things”, and also banged the door of his room late at night. We dressed up and gathered at the reception of the Residential Block, I was happy to see a good majority of “Bajrang Dal” joining the party. So, the gang moved towards the ‘Conference Room’, my roommate was the first one to try his luck and move into the hall. “No! Get out! !” was the voice which was very audible outside the hall as well. Well, we went on discussing some plans outside as how to make our way into the hall. “Nawaab” was very firm and satisfied,”Acchha hai na, ab usse jhelna to nahi padega”(“Its good, we don’t have to bear his lecture now”), he said. Suddenly, Mr. Khushwaha appeared before us, he was very annoyed which was pretty obvious. I don’t know how did I get that thought but I was very prompt to reply, “Ironing problem Sir, there are only three iron boxes and thirty-eight users. And owing to my generous nature I am always the last person to get a chance to iron my clothes. Genuine problem Sir, wish I could find an effective solution soon.” I even pointed towards my wrinkled shirt as a proof for my explanation. He was awestruck, didn’t know how to react to such a bold reply. So, he tried to escape the situation by asking the same question to “Nawaab”. Born actor as he is, “Nawaab” complained of a severe headache and fever for the past few days. He went on, “Sir, we want our lives to be transformed and each one of us here is in anticipation of a ‘Total Transformation’ from your side. You’re the only faculty who lives his life by choice and not by chance,” a dialogue so sarcastically put that even the noblest of all would get annoyed. “You’re Great Sir,” was added by my roommate as a token of appreciation to the “already on cloud nine” faculty. But he didn’t allow us to enter the class as he had to prove his “greatness” by showing his strict behaviour. He even gave me a lesson that once he had attended his class in rain-wet outfit during his school days and my excuse of ironing problem was a misnomer. Also, he called in our batch coordinator Mr. Ramanna Reddy to take our names so that we can be identified if we are found guilty on some other occasion as well. We were famous even within the administration now. So, he left us outside and went on to take the lecture. “Freedom”, was the expression of the moment but we decided to spice up things even a little further. We drafted an apology application. The script was provided by “Nawaab” and I was the lucky one to draft it on paper. The plan was almost complete as we decided to hand it over to the “Great Man”. 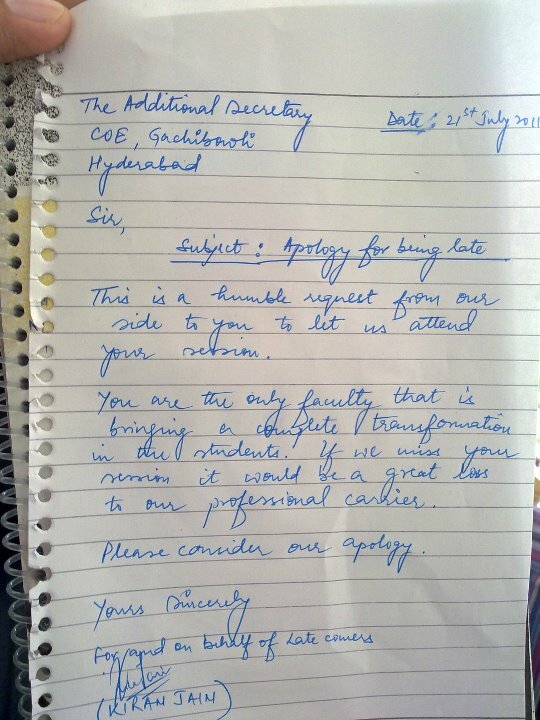 We tried to present the apology letter but all in vain, he rejected it outright without even hearing our case. But “Bajrang Dal” is known for its comradery, “Nawaab” went on and placed the letter on his table in his office. “Mission accomplished”, we were now sitting in front of the mess having a good chat with each other. Having enough time to spare we headed towards the ‘Computer Lab’, wasted some time there checking our ‘Facebook Accounts’, soon it was the time for first tea break. All the “successful class attendants” were staring at us like we were “aliens” from outer Universe. Well, I was expecting this kind of a gesture from the so-called “disciplined fraternity” but when one of our own men spilled tea over my brand new “Van Heusen” shirt, I was really annoyed. He is a Marwaadi boy, originally from Rajasthan but now living in Chennai. A decent guy, if you go by his looks and talking, but he had that certain satire in his words that conveyed a lot to the listener. I liked his “pause-and-speak” style of speaking with his eyeballs resting towards his upper eyelashes. I rushed to my room and luckily found it open as the room-service people were performing their duties. I quickly changed my shirt and took an oath not to be anywhere near where tea is being served as this time the brand was even heavier “Wills”. I am not boasting about my dressing style here but the exact thoughts need to be communicated, a thing which is very important. I reached the class and joined the “elite group” of late comers. We didn’t know as to what task was assigned to the students by the “Great Man”. Well, on our request and some boasting he gave us a story sheet asking us to perform a skit on the same. It was called as ‘The Donna Story’ and it was based on ‘discipline and its importance in life’. We prepared a beautiful script, with breathtaking dialogues and of course a lot of humour. But alas, the “Great Man” didn’t give us a chance to display our rarely possessed talents. “Sach kehta hun, agar chance mila hota to uss din bawaal machaa dete”(“If we were given a chance, we would have certainly provided some entertainment”). The other performers were very good, provided good laughter and it was a thoroughly enjoyed event. The “Great Man” was carefully taking notes of all the performers and I still wonder which dustbin in the campus did those couple of pages land up as we are still waiting to get that feedback. Lunch was approaching and I was very hungry, certainly not in a mood to do some “meditation” as I had already missed my tea due to the spill-incident earlier. But as they say, “Your fears are bound to be true”, and the “Great Man” was ready with yet another “invention”. I expected a ten minutes or a maximum of fifteen minutes session, but my God it lasted for forty minutes non-stop. I was so pissed off that I rose, tied my shoe-laces and left the class in disgust without even caring to glance towards the “Great Man”. At last, the “horrible session” ended and the lunch was served. “Ooh La La..!”, it was a lunch to be remembered and the only thing that came to my mind was to go for an “afternoon nap“. But, as the next two sessions were on “Appeals under Income Tax Act” and “Do’s and Don’ts in Practice” respectively, I decided to stay on and luckily so as the next two sessions were going to be the “best technical sessions” that COE had provided to me, if not us. We were sitting in the class after lunch waiting for the next faculty to arrive. In came a guy, tall, not handsome by any stretch of imagination, wearing a half sleeved, double-pocket, yellow coloured cotton shirt, jeans and sandals. He was not slim, I would say he was thin, so much as to give a healthy competition to my table tennis champion friend. But he was certainly darker than my buddy. To be frank, at first we didn’t realize that he was our faculty, but perceptions do change quickly in this world. He started off by describing his dress-code, we were left awestruck listening to his explanation. He further inquired as to how many of us were second generation CAs or to be CAs. There were a handful of students who raised their hands. “Ok, I am a third generation CA,” he replied. It’s really a rare thing in India for a family to have CAs for three consecutive generations as the CA Act itself goes back to year 1949 only. “And it is the most difficult thing to take-over an existing family practice. Fresh, first generation CAs find it more easy and comfortable to grow as their thought-horizon is much wider than others,” a case really well explained by him. Well, I have seen many “dare-devil” CAs during my article-ship days who would give a hard time to the Income Tax Authorities, but this person was really a step further. His act of showing the “middle finger” in front of Commissioner of Income Tax trying to ask for a bribe was something that requires guts. Not only this, the TDS (Tax Deducted at Source) case that he discussed with us with regard to a disputed piece of land is one of my favourites. My goodness! He challenged the validity of the notice itself when the case went to the Hon’ble High Court of Andhra Pradesh. This is how the top lawyers, the likes of Ramjethmalani and Soli Sorabjee are made. I was really very much impressed by his lecture and it was a great learning experience for me. I tag him as the most influential faculty at the COE who just took everyone by surprise in his allotted three hours. The long day ended, but only formally, we were called again by the “Great Man” after the sessions were over and we had retired to our rooms. I had already changed and put my clothes for washing when all of a sudden we were asked to report to the conference hall. “To hell with him!” I said to myself. I was putting on the third new shirt for the day, it was “Raymonds” this time. As soon as he spoke the word “Donna”, a couple of voices inside the hall resounded “Madonna,” and I dare say that one of those voices was mine. “Who said Madonna?” He asked in utter disgust. 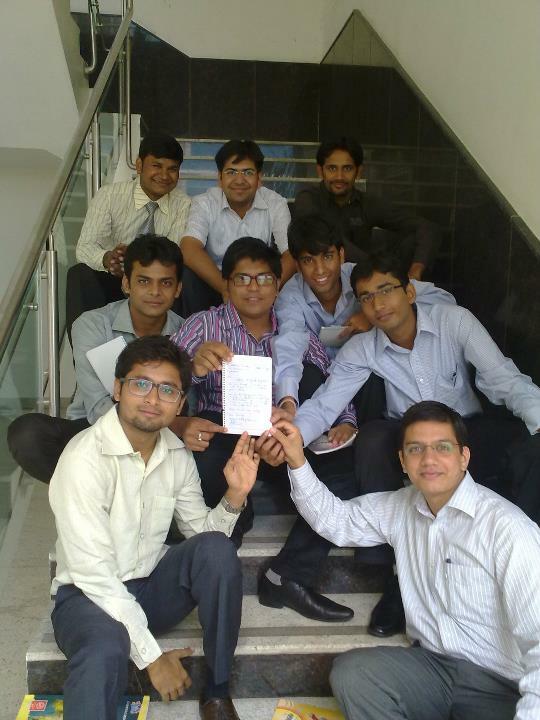 Finding no claimant he proceeded with his “preachings” and I silently left the classroom alongwith “Nawaab” and others. We sat for dinner, I was even ready with my plate when all of a sudden my phone rang. It was my “Punjabi friend” from Kanpur, “Bhai aaj to murga khaayenge”(“Bro let’s have chicken today”), sounded the voice from the other side. He is a very gentle human being with great skills in Table-tennis. Very particular about his hairstyle, he doesn’t care much about the worldly things and does everything with a lot of passion. We got along really well and its a treat to have such a caring friend. “Haan bilkul Bhai”(“Yes indeed bro”), was my reply. Well, all the meat-eaters and the ‘meat itself’ were accommodated in my room. I don’t know why, but always Room No. 306 i.e. my room was picked as the place for all the so-called “unholy things.” Nevertheless, we enjoyed the chicken, it was really good. 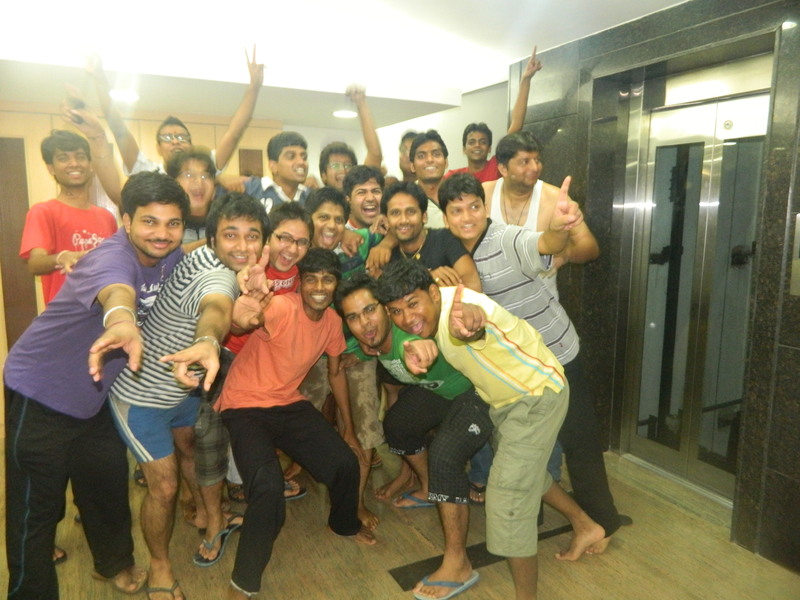 That night lacked the thrill and excitement that “Bajrang Dal” was so regularly providing to the batch participants. I guess all days are not the same. Thinking of this we slept pretty early that night. Next morning arrived, we reached the class much before the scheduled time today, call it the “Great Man” effect or our early slumber last night. The first two sessions were on “Income Tax Procedures” and an elderly faculty was there to take us through. The sessions were very nice and simple, no jargon and the experienced faculty really gave a good presentation on the topic. He had this amazing memory power to remember the “case citations” itself instead of the names which is really worthy of some appreciation. My friends prompted my name to give a summarised overview on the topic after the sessions were over. I went on to the stage, talked something here and there, gave a vote of thanks to our faculty and successfully escaped the situation. The post-lunch sessions were on “Practicing/auditing in other countries” and I was looking forward for a nice lecture on this occasion. Not only because I liked the topic but also for the fact that the faculty arriving was Mr. Manish Muralidhar from Deloitte. The “same name” thing was really exciting for me and I knew it would be a young faculty as the name ‘Manish’ is pretty new as compared to others. The man came, perfectly dressed, I would rate him as the best dressed faculty at COE. He was young and had a flamboyant style of speaking. His only physical weakness, no hair on his scalp. He was certainly not completely bald but lacked “the natural gift” to a great extent. The whole lecture went through, he shared a lot of things and I heard and noted everything in anticipation of getting close to my expectation. But it didn’t come. “Nonsense!”, I said to myself. I was really disappointed and even went and asked him about the unfulfilled expectation. He quietly ignored me and packed his bags to leave. We were later informed that Mr. Muralidhar had complained against two students for misbehaviour. “Crap..!” was my reaction, what can we expect of a person who wouldn’t even cover his own allotted topics. I was embarrassed to share my name with such a person. We were in “dire need” of a “formal session” after all that complaint saga, and so we did with discussions going through whole night, the “Bajrang fire” was rejuvenating again and aftermath were to follow soon. As for “waking up from the dream of the horror show,” I think we all were pretty much out of our “slumbers” now. Saturday morning and I was already thinking of “The Saturday Night” at the breakfast itself. We had only two sessions that day which were to be on “Valuation.” Everybody expected a very knowledgeable lecture but it was a complete waste. In my opinion, even an “Engineer” would be able to provide a better explanation on “Valuation” than what was provided to us by that faculty. Its ‘party time’ , first of our official outing was about to get off. I was even more excited as I had heard about “Ramoji Film City” as a very beautiful and interesting place. It can be described as a very big film studio, due to its vast geographical boundaries it was called as a city. It was a virtual world which we often come across in our Bollywood movies, television commercials/serials and other regional movies. Railway Station with a train that could not move, Airport with a stationary aircraft and a Palace for all the historical and mythological shootings were some of the major attractions. We were travelling by a bus, it was not a “Volvo” make, not even our own “Tata”, it was something else altogether. But it accommodated all of us and that was the best part. We sang and danced all through the way, everybody trying to mark his/her signature move for others to see and appreciate. I also participated, though one step only and that was more than enough for a dancer of my class. Our South Indian friend from Nagpur and “Nawaab” were the constant movers and shakers till we reached our destination. I also remember our Kerelite friend singing “Guzaarish”, a hindi song from the movie “Ghajini”, if you judge it on technical grounds it was pathetic but still we all enjoyed it. We reached the place and started our tour. It was a different world altogether, had it not been for the other locals who had come to visit the place we would have mistaken it for “Disney World”. I have never been to “Disney World” so don’t blame me if the above comparison was improper in any sense. So, we enjoyed a lot, lots of shows, activities and rides made our day. And who can forget the amazing ride of “Twister”, at first it looked scary but then as everybody was going in for a ride I hopped in as well. “Haalat kharaab ho gayi usme baith kar, duniya ghoom gayi…” (“Didn’t feel good after the ride, world went upside-down”), and I am sure it went the same way for the most of us though they won’t admit it thinking it as a sign of weakness. It would be a grave injustice if I don’t mention the “gardens of Ramoji”. “Awesome” is the only expression that I can use. “Agar India me har garden ko aise maintain karke rakhein to West se zyaada khoobsoorat lage humaara Hindustan…”(“If each and every garden in India is maintained like this then India will be more beautiful than any of the western countries…”), I said to myself. Well, we went ahead to create a lot more “bawaal” and decided to join the “rain dance”. It was a thoroughly enjoyed event and one would think that it would have been an “all guys show”, but not to be, we had a female participant as well. She had her own style of doing things and was a much better fit in the Campus environment than most of us. We later coined her as “dabangg” due to her frank behaviour and unique style. Her activities in the weeks to follow would make her earn the prestigious “Bajrang Dal” membership though the same was also supported by some solid “jaan-pehchaan”(“references”) from the “table tennis fraternity”. So, the “rain dance” was a “bawaal”, rightly put by my table tennis champion friend,“Paani me aag laga di thi…”(“We set the water on fire…”). He is tall and thin, I mean very slim and loves his cellphone. A good dancer, he likes to enjoy life slowly and steadily which was evident in our “official meetings” as well. One of my best friends today, we both share one common feeling, “zindagi ko enjoy karo, duniya jaaye bhaad me” (“enjoy the life as it comes, to hell with this world”). Also, his traditional “haoo..” for “haan”(“yes”) will always be remembered by me due to its unique style and dialogue delivery. On our way back, we again sang and danced in our bus, though the ‘original zeal’ was somewhat missing, blame it on the ‘tired nature’ of passengers or ‘wet clothing’ of rain dance participants. It was raining heavily by the time we had covered almost half the distance to our campus and the ‘natural showers’ suddenly stopped as we deboarded at our destination, what a perfect timing! You can’t beat time by any stretch of imagination. Even if you try to avoid the anxiety for a scheduled scheme of things it will certainly make you more conscious just before the happening of the event, I call it as ‘the vacuum phase’ just because it provides no medium to accommodate any kind of thoughts. Very well versed with the above philosophy I still tried to outwit the invincible but gradually as I was making my way back to the room I realized that its time for “The Horror Show”, its time for “CA Final Results”. Still one day was left for the ‘D-day’ and that was even more ‘horrific’. Next day was very quite with all the ‘Result buzz’ in the air. On our special request to one of the Council members who was also a faculty that day, we were granted a half-day leave for the next day which was to be the day of “The Horror Show”. I can never forget the uneasiness and the sunken feeling of that night. I also believe that the same was experienced by all, and if not by all then atleast by the members of the so-called “formal meetings” as we were up all night trying to overcome “The Horror Show”. We were chatting, singing, dancing and joking with each other pretending to be not at all bothered about the ‘mysterious consequences’ that were to follow. Who in this world doesn’t want to be successful? In every expression, “Jo hoga dekha jaayega, main zyaada tension nahi leta”(“I’ll take things as they come, I don’t bother much about the future”), there’s a very strong sense of request to the Almighty for a positive outcome. So, we spent all night doing something or the other and as the “cruel morning” approached everybody went to sleep except for me and my Table Tennis champion friend as both of us decided to enjoy some early morning Table Tennis practice. But after an hour or so we also decided to part our ways to our respective rooms and take a ‘power nap’ before “The Horror Show” began. I woke up to a thumping sound on the door,“aa gaya shaayad”(“I think it’s out”). I had never been so keen to ignore any such disturbances, it was quite evident till now that “The Horror Show” had already begun. My roommate, as always, was not responding at all. Finally, I gathered some courage and hopped out of my bed to unlock the door. A short guy with spectacles on came rushing in and announced, “Roll Number bol”(“Tell me your Roll Number”). I asked him, “Result aa gaya kya?”(“Has the Result been declared?”). He is short, academically intelligent and a punctual professional. His ‘punctuality’ became popular as he used to set an alarm even for the washing of clothes in the washing machine. May be it was just a rumour, but I never objected on the same as his personality seemed quite capable of doing such a thing. Moreover, his patented dialogue with his right hand raised in confidence,“CS qualified Sir!” was a frequent phenomena. To be very frank, he was so well-disciplined that some of us sometimes thought that life is really tough if you want to lead it ideally. “Haan! Tu apna Roll Number Bataa”.(“Yes! You just tell me your Roll Number”), he murmured doing something with his cellphone. Meanwhile my roommate woke up and arranged his laptop and internet connection. We asked our visitor about his result and he smiled and gave the ‘good news’. We congratulated him and said we would prefer the laptop screen instead of the cellphone display, though nothing would matter now. Slowly, there was a gang of hopeful students in my room. I was slipping myself away from the crowd to give time to my nervousness and anxiety but the sheer excitement to know others’ fate drew me closer towards the laptop screen. One of the participants punched his roll number, “passed” was the call from the ICAI server. The score was very good so he also checked the merit,“Bingo! Rank 21!” He rushed out of the room in joy but we couldn’t follow him to witness his celebrations for obvious reasons. Next one was the same, a change in numerals only,“Rank 28” this time. This was getting heavier for me now, I was not jealous instead the hope to pass was ever-growing. My roommate was the next one to punch in, “passed” was the call again, not a very high score but still in CA a first attempt crack is worth appreciating. He was very happy and excited, crying out high and loud, but to my surprise he stood his ground holding my hand to take me through the climax of “The Horror Show”. On the other hand, I was feeling that it would be “curtains” for me as the trend of falling scores had already started. I still wish that I had a wrong feeling. “Failed” was the call from the wretched ICAI server (obviously for me only). Everybody was quite, I got up, informed my parents and went to sleep. Sleeping was also not easy but was better than being awake. When I woke up, it was already lunch time and some of my friends including those who had a similar kind of outcome as mine were there with me in my room. We discussed somethings just to support each other and decided to carry on our journeys with the same passion and intensity. Though it sounds very spiritual and intellectual but mark my words it was really helpful. We were soon “artificially smiling” searching for the real ones somewhere in others’ happiness. I dressed up and went into the amphitheatre where the newly qualified Chartered Accountants were celebrating. Though a misfit there, I approached everyone and congratulated. And not to forget, I also enjoyed the ‘controversial cake’. Class kicked off with some music and everybody was seen dancing, I clapped for everybody in appreciation – they truly deserved it. The topic for the day was ‘Communication’ and our faculty started speaking about “The Horror Show” itself. Well, I can’t disclose the remarks that I had used for him at that point of time for deviating from the topic but the gravity of the situation can be easily understood by my action of leaving the classroom immediately. I went to my room and slept. I don’t remember much about that evening except for the fact that each passing second felt like the cut of a knife on my body. “Life goes on!” is what people say and we had one of the most ‘talked about’ class scheduled for the next day. to be continued to Week Three – Part II……..
We reached the Campus gate. There’s no escape now, “ab to aar yaa paar..! !” (“it’s now or never”), my heart said to me. There’s something about breaking rules, the urge is so strong and enticing that you can barely resist it. I was carrying a bag, it was a sack actually, full of something. As I was trying to rush in with Dada (one of my batchmates), who was screening me from the guards, a voice stopped me,“Sahab! borey me kya hai?” (“Sir, what’s inside the sack?”). Before I could react or Dada could make a move the security guy announced,“Sir, checking hogi..! !”(“Sir, I will have to check”). I whispered to myself,“lo, ho gaya bawaal” (“time for another bawaal”). But Dada is really ‘a Dada'(‘a senior person’) in its true literary sense, he rushed on towards the guard in one of his very unique ways, ” Ohh..ho!! Pandit Jee, tum bhi kaisi baatein karte ho, bacche hain khaane-peene ka samaan to laayenge hee..! !”(“Pandit Jee, kids will obviously bring something with them to eat”). The guard smiled, I thought Dada’s magic words had worked, but he took the sack from my hands and started searching. Every voice was now echoing between my ears like it does when water seeps into your ears while taking a bath. Checking stopped,“Sab theek hai Sahab, par itni cold drinks ka aap kya karoge?”(“Sir, everything’s alright, but what would you do with so much of cold drinks?”), the guard asked casually. Dada chipped in,“bacche hain, pee lenge.”(“kids will have it”). I was still surprised,”COLD DRINKS…haha..! !”, not very much though because we were not idiots and the thing that shouldn’t have happened didn’t happen, we escaped. So now we were rich enough to celebrate and skip regular canteen meals provided in the campus. And please don’t talk about breakfasts, I have had it just four times in the canteen out of the whole forty-two days and I am sure I am the record holder though there are some close competitors for the title as well. Our batch had a significant majority from Northern India and I can guarantee nobody enjoyed the South Indian cuisine after the initial couple of days. I remember one of my friends saying,“bhai” as we used to call each other,“Yaar Manish, saale roz-roz ye idli-dosa kaise khaa paayenge yaar, tuu khud bataa bhai?”(“How can we have idli-dosa for every meal?”). Another one used to say,“Oye, kuchh paranthe-puronthe, ghee-makhan to hona chahiye na naashte me.”(“Breakfast should at least have paranthe and butter”).Well who could resolve this issue better than the man himself – ‘Dada’. He requested the same with the administration and soon some North Indian cuisines were introduced in the breakfast menu. The mysterious contents of the ‘controversial sack’ were deposited in the secure boundaries of ‘Room 310′ the room that no participant of our batch could ever forget. Why was it so secure? There were no cipher or bolting door locks to make it secure, in fact, only a few know that even the cupboard planks were broken. So, how was it secure then? The answer is simple, the brand ‘310’ in itself was so notorious and infamous that nobody ever dared to breach the code of conduct to be maintained. It would also be important here to mention that the brands “Bajrang Dal” and “310” were synonyms, the latter being the ‘registered office’ of the most popular and populated group. Weekend gone, I was a common friend to most of my batchmates but a best friend with none. As soon as this thought came to my mind the world adjusted itself once again to solve my problems. I was sitting with a guy with high-power spectacles on, naah…he was not a bookworm, in fact he is one of my best friends today. He was very conscious about his looks and carried an amazing artistic talent. We used a term “introvert” for him a little later towards the end of the batch. We knew each other, but not very well, though everything was going to change now. “Wow..! !” was my reaction and we are still known by these names by our batchmates. I don’t know the reason behind such ‘naamkaran'(‘naming’) but it was cool, each one of us enjoyed it. Many other pet-names emerged as well and I will discuss them in the ‘weeks’ to follow. It’s hard to imagine as to what impact would a simple act of naming each other would have on the relationship between individuals. I guess the meaning of the word ‘bhai’ was getting its true justice now. Soon after, the above people were coined as “the Promoters” of “Bajrang Dal”. First “official” meeting that is worth mentioning was between some of the Promoters and our batch’s Table Tennis champion which would follow. Now, the “official ” nature of this meeting was appreciated by all who participated and some significant disclosures were made. The meeting place was surprisingly changed due to the “official” nature of the meeting and the “controversial sack” was very useful. Meeting was followed by dinner, though from the campus canteen only, it was great for obvious reasons. There was a lecture on Professional Etiquettes in the first week itself, some sweet memories cross my mind from that to. The lecture was very informative, the part that I enjoyed the most was the ‘newspaper dressing activity’ which taught us the art of dressing for the occasion and ‘the handshake courtesy’ in which we were practically informed not to get carried away and press the hand of a lady so tight that it would hurt her. The most surprising thing that day was that everybody was trying to act sophisticated and well-mannered, the results were quick but lacked permanency which was evident in the second week. I was always late for the class, the main reason being our “official” meetings and the biggest problem “ironing”. I had never ironed my clothes myself before I came here. I took help from one of my batchmates from Kerela, the most humble and helping person that I have ever met in my life. In simple words,“bahut achha insaan”(“a beautiful human being”). He taught me to iron formal shirts which was something I was struggling with. Also, he didn’t understand and speak much of Hindi but conversing with him in English was very exciting. Well, I think I should now talk about the ladies of the batch as well, they also deserve the much respected fame that our batch had to offer. I can’t say much about others but I was really afraid of all my female counterparts in the batch, especially after what had happened in Mr. Mathew Joseph’s lecture in the first week. But when I had to work in groups for tasks assigned in the class, the fear slowly vanished and everybody came along as very nice people, not the ones who would make you feel nervous or separated. And there were some beautiful ladies as well, seventeen of them, each in her very own way, though I reserve my right to have “favorites” which would never be officially announced in the time to come. Our’s was a multi-geographical batch. There were people from states like Punjab, Himachal Pradesh, Chhattisgarh, Kerela and even Goa apart from the regulars like Delhi, Maharashtra, Madhya Pradesh and the like. I think this was the most incredible learning than any of the regular course curriculum, India is really great, rightly said by someone,“yahan kos-kos pe paani badle, chaar kos pe baani”(“Water nature changes here each mile and there’s a different dialect every four miles”). A lecture on “Goal Setting” by Mr. Gampa Nageshwar Rao in the first week was not something that I cherish a lot. I have high regards for the man but it went too far in the end and disturbed all of us emotionally, though it’s totally a personal view. ‘India 2025’ was our next activity, this task was assigned to us by none other than ‘Fungus’. We had to prepare a presentation on the topic in a group of five. Another controversy arose as to how the groups were decided. Obviously, it was rigged. What was the basis? Who did it? What was the purpose? Well, that’s confidential and even I am eager to get the answers even today. I dressed so formally for the presentation that even the “British House of Lords” would have feared competing against me. This time I was wearing a tie, the same old deadly combination of white shirt, red tie and black trousers was making me anticipate some complements, yes from the ladies as well. But no success, I guess something was missing, fortunately I found it in the weeks to come. The presentation went really well, everyone was good but “Nawaab” stole the show that day. He had managed to learn some beautiful lines from a bollywood movie ‘Namaste London’ and enacted it superbly. Well, he’s the guy who has this natural flair to communicate and impress. Good sense of humor and perfect timings are to his credits. We went along really nicely and both were a significant part of the “official” meetings. “Aage chalke badaa bawaal machaaya humne”(“We created a lot of fuss in the weeks to come”). Classes went on, yoga sessions had started and the late risers tried their best to at least say “hello” to the yoga instructor once, but all in vain. I asked one of my friends to wake me up as he had a very loud pitch voice, so that would have helped. He was a South Indian from Nagpur so his expressions were from the “bambaiya dialect” only. He followed my instructions judiciously and banged my room’s door every morning, but I think I was least bothered about it and gave full priority to my sleep. No doubt, he had failed every time. Weekend was near and this time a trip was planned to “Ramoji Film City”. “Bawaal”, a hindi jargon that means “stupendous” in english, is the expression that I have been living with day in and day out for the last five months now. Yes, it was the pleasant weather of July 2011, one of the most important year for me as a professional, or you can say “to be” professional – a Chartered Accountant. For now I was frustrated of people asking me, “kaun si university se CA kar rahe ho…. ?” (“which university are you enrolled with for your CA studies…. ?”) and I was sick of explaining that its regulated by an institute-ICAI (Institute of Chartered Accountants of India), set up by an act of Parliament, the anxiety to get my hands on that prestigious Membership Certificate was ever increasing. Ruined by these technicalities, I decided to run away from the fear of failure and joined a professional skills development program at The Centre of Excellence, Hyderabad-city of pearls, Nizam and biryaani, here came my first date with “Bawaal”. Though I know the word very well but never felt it as strong as I do it now. We were fifty five students, ratio in favour of boys, a common site in a country like India. It was a 42 days residential course and the response of previous batches was very positive and attractive. Further, the very existence of world class campus facilities was exciting and eagerly awaited for. The course began, everything seemed to be slow and boring, people were shy and I admit I was one of them. Soon, friends emerged and regular sleeping hours were restricted to a maximum of three. I guess the stage was all set for something extraordinary-something to remember all our lives. “Bawaal” was getting very popular and even the food was praised with the magical word. Most importantly, the ‘magic code’ was coined by my roommate, one of the better poets that I have met. So, came the first testing day. No, it was not any official challenge but a surprise one, and I am still searching for the reason as to why Mr. Mathew Joseph chose me as the first candidate for the challenge. Was it for the reason that I had answered his question on “brand appeal” as “it (a soap) reminds me of a beautiful bollywood heroine…” or was it just a matter of chance? Anyways I had to face the challenge now. At the end of the day, in my room I was feeling different, a negative different. “I lost” was all over my mind, it’s not a big thing that I was worrying about but the fact is I was very, very upset. I have this incredible ability to disguise my feelings except from my family, they know it before I realize it myself. But I must admit, it made me much bold and determined, Mr. Joseph’s trick was working well. Everyone joined for evening photo sessions and fun was all around, it was haphazard because there was no mutual consent, in fact there were some small groups which kept to themselves, I was also a part of one of them. “Bajrang Dal” was my group’s identity and we were a bunch of seven or eight people, all guys, of course for obvious reasons. We started having our group meetings after dinner which continued till early mornings and since we were very loud and pompous soon many other guys joined in as well. Gradually, “Bajrang Dal” became a well recognized group of “hooligans” mostly characterized for it’s ill-behavior and mischief rather than some of the positive aspects that professionals ought to carry. Classes went on and we were faced with one more “Bizarre Element” on this earth, one of the greatest psychologist, philosopher, paleontologist, physiologist and the list is still being updated for want of professions and adjectives. I would call him the “Total Transformation Faculty” or “Fungus”-a more famous title. I am still trying to comprehend his expressions in class, My God it was pathetic. My roommate used to giggle,“he is bawaal in his very own way…” Well I was scolded by him on the very first day of his lecture for not wearing a tie and it didn’t help me anyway in the time to come. Weekend was near, first weekend and the freedom to go out and enjoy was getting us excited, yes we were not allowed to go out of the campus except on weekends, that too subject to permission from Fungus and time constraints. Still, we were excited and all set to go. The eagerly awaited day came. We all went out, obviously in groups. It was good fun in shopping malls, gaming arena and food court. Everyone was so happy like he/she had got a pardon from death sentence. With all this positive energy we returned to our campus literally chanting “bawaal” on our way back, and then something happened that shouldn’t have happened.